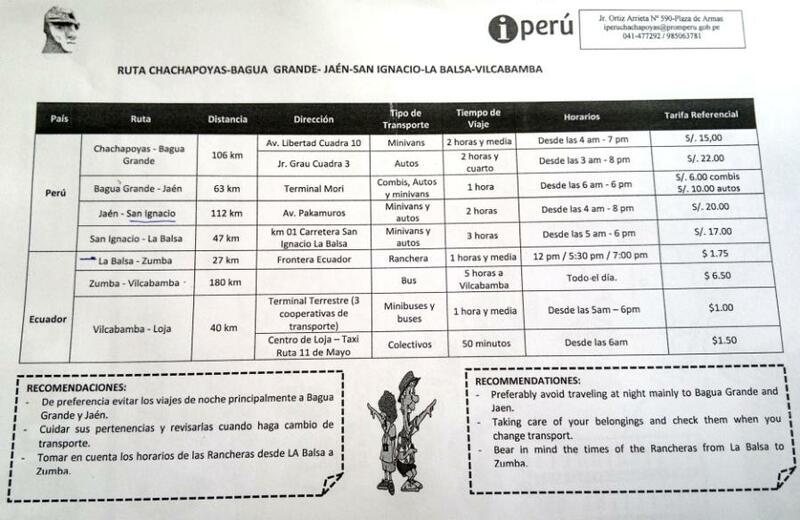 How to get from Chachapoyas to Vilcabamba? Planning or trying to work out how to cross the border from Chachapoyas to La Balsa and on to Vilcabamba? The journey from northern Peru into Ecuador can be confusing. The route is renowned for being a scenic rural crossing with bad roads and many vehicle changes! We took this journey and found that it was pretty straightforward thanks to the Chachapoyas tourist office. We've added a photo below which is a one pager to help you.The image gives you details of the path you need to take for the border crossing. This is from the Chachapoyas tourist office as of August. Get in contact with them to make sure there are no changes. Otherwise, enjoy the journey - it is stunning!